DILMS safety contactors from EATON ELECTRIC are designed to ensure reliable switching in security applications. Safety of the user is always a top priority for EATON ELECTRIC. Thanks to a combination of proven technology with the latest security standards, DILMS contactors are the perfect choice for every installation. 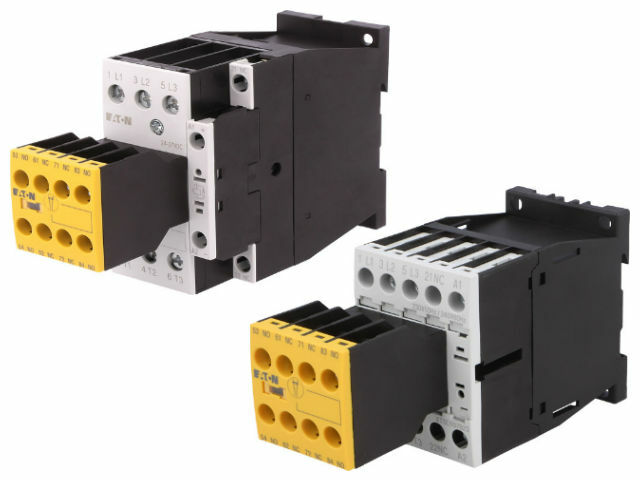 All versions of the DILMS safety contactors have a front-mounted auxiliary contact that cannot be detached. Integrated mirror contacts and interlocking opposing contacts further increase the safety of these contactors. Their yellow cover allows for quick and easy identification of safety circuits. A built-in inspection window located directly over each contactor's switch-position indicator allows for easy monitoring of the status of the device or installation and reliably prevents the contactors from being activated manually. These safety contactors from EATON ELECTRIC are CE, UL, CSA and SUVA-certified and are available in four different sizes. Their current range is 7–150A. Check the full range of DILMS safety contactors from EATON ELECTRIC.